The annual Nano Research Award, which is sponsored by Tsinghua University Press (TUP) and Springer Nature, was presented to two outstanding scientists on 1 July 2018 in Chengdu, China. Lei Jiang is professor at the Technical Institute of Physics and Chemistry, Chinese Academy of Sciences, and Chad Mirkin is the George B. Rathmann professor of chemistry at Northwestern University. 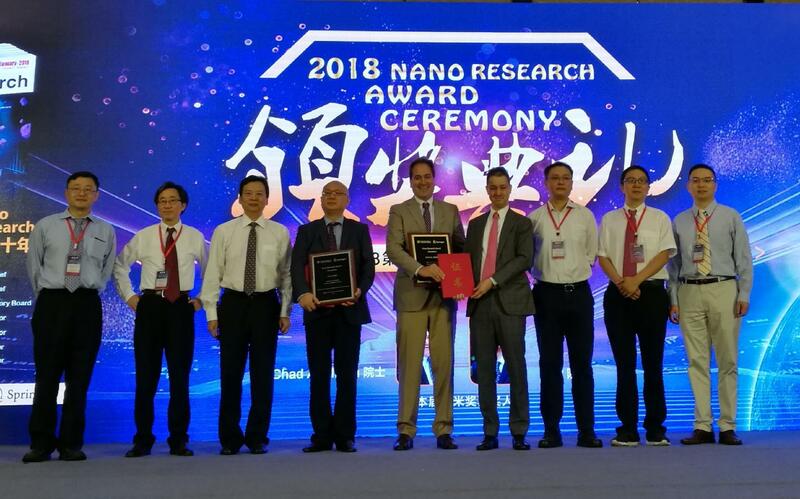 Both winners gave keynote talks at the 2018 Sino-US Nano Forum, where they officially received the award. Lei Jiang works on developing intelligent materials and devices including those which exhibit special properties such as wettability – the degree to which a solid is wetted by a liquid. He is a member of the Chinese Academy of Sciences and the recipient of many honors and awards. Chad Mirkin's research focuses on controlling the architecture of molecules and materials on the nanometer scale. In particular, he developed a method known as dip-pen nanolithography which allows scientists to create patterns on a surface at a scale of under 100 nanometers. He was recently elected a foreign member of the Chinese Academy of Sciences and has won numerous other awards. Nano Research is an international academic journal sponsored by Tsinghua University and the Chinese Chemical Society, and is jointly published by Tsinghua University Press (TUP) and Springer Nature. Its 2017 impact factor calculated by Clarivate Analytics is 7.994. The Nano Research Award, which was established by the journal Nano Research together with TUP and Springer, is given to individual scientists who have contributed significantly to nanoscience research. The winner is selected by an award committee made up of the editors-in-chief, associate editors, representatives from TUP and Springer Nature. Past awardees include Charles M. Lieber of Harvard University, Paul Alivisatos and Peidong Yang both of University of California, Berkeley, and Yi Xie of the University of Science and Technology of China.